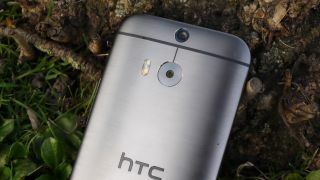 Right now the stream of leaks coming from HTC is more like a full-on flood: we're seeing pictures and specs lists for not one but two handsets that are set to accompany the HTC One M9 in the firm's line-up for 2015. Today we've had our best look yet at one of those handsets, the HTC One M9 Plus. Pictures fresh from Iapps.im show the smartphone in all its (fuzzy) glory, complete with a round camera lens, a physical home button, and a China Mobile etching on the back. That etching hints towards a China-only launch for the M9 Plus (or M9+). As with the One E9, we're not quite sure yet about where in the world these handsets are appearing, as HTC hasn't been very forthcoming with confirmation. We should hear more in April, because the Taiwanese manufacturer has scheduled a press event for the 8th of April in Beijing. It's comes with the slogan "More than One" - which sounds like they'll be showing off some brand new handsets - and the device on the invite appears to have the Duo Camera setup HTC just ditched on the One M9. At the moment it sounds like the One M9 Plus will offer a 5.2-inch screen with a 1440 x 2560 pixel resolution, which is a decent display upgrade over the original HTC One M9. The CPU and memory are also said to be getting a boost with the Plus model. Hopefully HTC is going to put the record straight in a couple of weeks and we can weigh up all of these different phones properly. As soon as we hear anything official from HTC we'll let you know.